Enrico's second wife, Mary, dedicated her last years to seeking recognition for her husbands achievements. Enrico's close friend and colleague, Jim Thakoordin, worked with friends to produce “Our Lives, Our History, Our Future”, in 2012, telling Enrico's story and the stories of other fighters and campaigners. In 2015 Mary Stennett was introduced to Liz Millman at the Black History Month ​Civic Reception at Colwyn Bay Town Hall at 6pm with recognition for Outstanding Black Women on Wed 15th October. They stuck up a friendship and Liz promised to support Mary to gain the recognistion of Enrico's important work. In BHM 2016, the Black History Month Awards in North Wales were entitled the "Enrico Stennett Awards" given to orgnisations during "Hate Crime Awareness Week" for organisations who were doing something towards combatting racism and hate crime, but who were not doing enough! 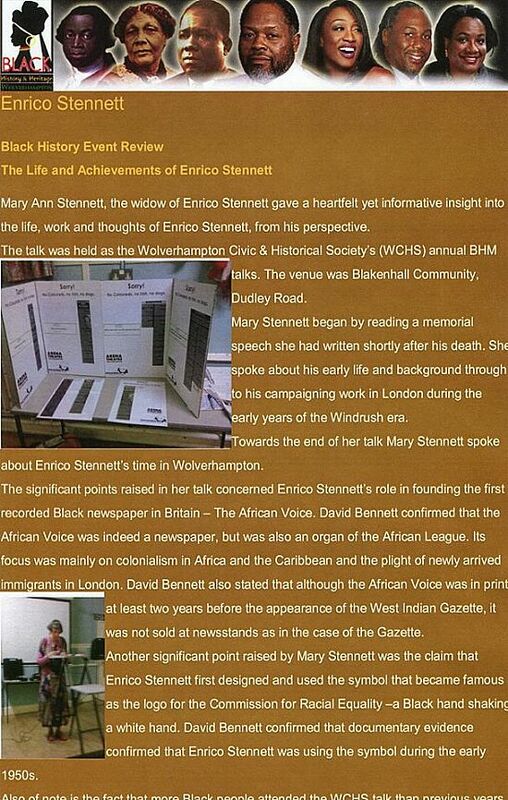 In 2017 Mary and Liz worked to raise awareness about Enrico's work and Mary spoke in Wolverhampton at the BHM presentation for the Wolverhampton Historical Society. In 2018 Mary was invited as guest of honour at the Windrush recognision event in Bangor, to recognise the great achievement Enrico made towards challenging racism. Mary was able to present a copy of “Our Lives, Our History, Our Future” to the Jamaican High Commissioner during his visit to North Wales in August 2018. Enrico Stennett was mixed race and before reaching his teenage years he had experienced racism, prejudice, hostility and rejection. This subsequently determined the direction of his adult life throughout which he diligently worked to free people from exploitation, suffering and degradation. After several attempts, Enrico managed to successfully gain a passage on a ship bound for Britain, arriving in September 1947 at the age of 19, the year before SS Windrush docked. His aim was to find a country where he felt he would be treated more fairly. He was shocked and troubled by the challenges he and others faced on arrival and within months he had become a member of the League for Coloured People, then joined the Coloured Workers' Association of Great Britain and Northern Ireland, speaking regularly about issues of concern at Hyde Park Corner. In 1950 with his first wife, British born Margaret, he founded the Cosmopolitan Social Society, along with his Jewish friend Stanley Freeman. This organisation was established to cater for the social well-being of the Caribbean people who were arriving into the country at the time, as well as, Caribbean ex-Army and ex-RAF personnel who had not returned home at the end of the war and were living in London. Then in 1952 Enrico, along with Mr John Longmore from Sierra Leone and Mr Mubutto from Nigeria, founded the African League, and as Chairman of the African League, Enrico worked with African leaders in their struggle for freedom in their respective countries. From then on Enrico' achievements were many and varied, and he is credited with starting the first Black Newspaper "The African Voice" and his dedication to the cause of challenging racism and promoting equality of opportunity was remarkable. As well as his campaigning, Enrico took on a variety of jobs when first in Britain, including working in cafe’s and dancehalls, where he was employed part as a dance partner at the Mecca Ballroom in London and other clubs. Then he was able to take on community support work in Race Relations moving from London to Coventry and Wolverhampton. He retired to Jamaica initially, then when things didn’t work out for himself and his second wife Mary, they settled in North Wales, where they had many happy memories and where Enrico continued to be active in support of the North Wales Race Equality Council until he died. Enrico’s experience in Jamaica and especially in London made him the person he was. Even though he had completed his three score years and ten, he was never a bitter or angry man, but a very thoughtful, considerate, determined and committed person to the working class in Britain and the world. However his second wife, Mary Stennett, felt very strongly that his experience and commitment to fairness and justice should have been better recognised in his lifetime, as she had seen how hard he was trying to change our society for the betterment of everyone, black and white. Enrico Stennett was a great man, a true Jamaican hero and ambassador. His talents and charm helped him dance his way through life’s journey, as a business man, activist, friend, father and husband. He was more than a mentor; he was a solid force that still reminds us of the Jamaican dream that must still be worked for. This is overly long at 600 words - so any ideas to reduce it to 400 would be welcome! We are mindful that there might not be an exact fit regarding your nominee and categories below. However, please merge categories and or create a new category provided each question or criteria (on the left-hand side of the page) can be answered. Furthermore, clearly list the new category on the application form and or a separate sheet of paper on which you wish to develop your case for consideration. Add anything you like to these notes!